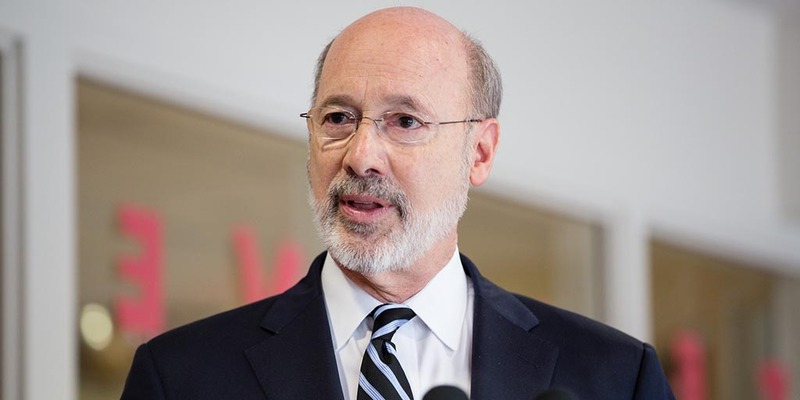 Harrisburg, PA – Governor Tom Wolf today detailed the plans for implementation of the $55.9 million federal Substance Abuse and Mental Health Services Administration (SAMHSA) grant secured last week for the state’s response to the opioid epidemic. The planned initiatives focus on prevention, treatment, recovery, education, and training. The Department of Drug and Alcohol Programs (DDAP), along with Governor Wolf’s office, led the application effort with multiple state agencies now charged with implementing and tracking each initiative. The initiatives included in this grant focus on three overarching “buckets,” including housing supports and assistance, criminal justice and law enforcement initiatives with a focus on reentrant supports and prevention, and workforce development strategies. Led by the Department of Human Services (DHS) in partnership with the Pennsylvania Housing and Finance Agency, the opioid housing initiative will direct $15 million for pre-tenancy and tenancy supports and rental assistance for individuals with opioid use disorder in need of supportive housing. Also, the grant prioritizes an additional $2 million in funding to develop person-centered Health Homes to provide comprehensive physical and behavioral health care to pregnant women with OUD. These Health Homes will improve access to high-quality care for pregnant women living with OUD. The grant funding will allow the Department of Corrections to significantly expand access to all three FDA-approved medication-assisted treatments (MATs) to re-entrants and support the agency’s efforts to hire an in-house addiction medicine specialist. In addition, the Pennsylvania State Police (PSP) will use its Overdose Information Network (ODIN) to identify areas of the state most severely affected by drug trafficking and use grant funding to increase community policing in those areas. PSP will also utilize grant dollars to increase awareness of and access to treatment for individuals with OUD and their loved ones. The Department of Health will lead the establishment of a Pennsylvania OUD Loan Repayment Program to provide loan repayment for eligible health care practitioners who work in Health Professional Shortage Areas (HPSAs) and specialize in treating individuals with OUD. In addition to the priority buckets detailed above, increasing access to treatment and recovery supports through Pennsylvanian’s 47 Single County Authorities (SCAs) will remain a top focus. The grant will also support the development of regional programs focusing on the education, prevention, or identification of OUD for Pennsylvania veterans, their families or caregivers and the identification of resources available for referral for treatment. This collaborative effort will combine local, state and federal government partners, veterans’ service organizations, and service providers across the commonwealth in a regional effort to combat this crisis. Complementing this significant federal investment are two, $26.5 million grants that have been received over the past two years from SAMHSA as part of the 21st Century CURES Act. With the new SAMHSA grant, Pennsylvania has received a total of $108 million in federal funding to fight the opioid epidemic. For more information on the Wolf Administration’s efforts to fight the opioid epidemic, visit governor.pa.gov.